Seismic and magnetic geophysical methods have both been employed to produce estimates of heat flux beneath the Antarctic ice sheet. However, both methods use a homogeneous upper crustal model despite the variable concentration of heat producing elements within its composite lithologies. 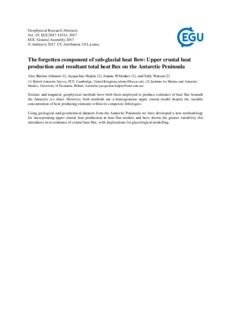 Using geological and geochemical datasets from the Antarctic Peninsula we have developed a new methodology for incorporating upper crustal heat production in heat flux models and have shown the greater variability this introduces in to estimates of crustal heat flux, with implications for glaciological modelling.